There are several ‘binding energies’ in science. Initially the Quarks (of lightest generation) and Gluons are ‘de-confined’ as a plasma of quarks and gluons. Then they get ‘confined’ into baryons and mesons. Three quarks combine to form baryons (protons and neutrons) and quark/anti-quark pairs combine to form mesons. In the ‘de-confined’ state the strong force is spread across. Once Quarks get confined into baryons, the strong force gets limited to baryonic distances. This ‘confinement’ of quarks into baryons and mesons is also a ‘binding’. But the terminology binding energy is not used to denote this. This is called ‘Confinement’ of quarks. Vrsakapi is NOT about this confinement of quarks. Residual Nuclear force is an attractive force that acts between all nucleons (baryons) at the short distances between them (about 2 x 10-15 m). Within the nucleus, where the protons and neutrons are very close together, the nuclear force dominates the repulsive Coulomb force and holds the nucleus together. The strength of the residual nuclear force field is often measured by Nuclear Binding energy. Vrsakapi is about this Residual nuclear force field, as it is a measure of the binding energy. When nucleons bind, the new mass of nucleus is less than the sum of the mass of nucleons. The difference in masses or the missing mass is said to be expelled out as ‘Binding energy’ during the Union of nucleons. This is the binding energy that Science talks about, which is a missing mass. This binding energy is caused by a nuclear force field and is the measure of the strength of the nuclear force field. In this sloka it is stated that when the ‘Vrsakapi’ attaches to the nucleons, the top is broken into pieces which do not go through the dawn of the Universe ‘smoothly’, causing a defect in the matter at birth. Thus Vrsakapi is the residual nuclear force field that attaches to the nucleons, binds them, but breaks the top of the matter of which some of them do not go through the dawn, causing a defect in the matter at birth. When electrons bind with nucleus, the mass of atom is less than mass of the nucleus and electrons. The difference in mass is very very small, but do exists. This missing mass is said to be expelled in the process of union and is called atomic binding energy. Atomic binding energy is very small compared to nuclear binding energy. In this sloka, Indrani or electron is asking Vrsakapi (which I defined as nuclear force field) to come back from the nucleus and create a bigger ‘net’, creating more and more elements. Thus atomic binding energy is seen as similar to nuclear binding energy. But Indrani is also saying that the Vrsakapi when coming back from Indra (baryons of the nucleus) becomes Indra-ja or born of Indra and creates a bigger net. The vrsakapi that bite and grounded the Indra is different from the Vrsakapi that is coming back as it has become born due to Indra. Thus there are two Vrsakapis that confuses the scholars doing traditional interpretation. They acknowledge this confusion. The residual nuclear force-filed binds the nucleons. What comes back from the baryonic nucleus, the protons is Electro-magnetic force field, that is born out of protons (Indra- ja) and is the one that binds the electrons and creates the ‘ribbed’ (parzur) beings. Thus Vrsakapi, Residual nuclear force-field that binds the nucleons, becomes Son of Indra, the electro-magnetic force-field caused due to protons that binds the electrons. Have a look at how the translation and science match precisely.. When Vrsakapi attaches to Indra as nourishing companions,strong force does not flow, it gets confined and Indra is no longer an independent ‘Deva’. Indra goes into the ‘Heart’ of the Vasu (Atom) and becomes a Vasava. In the Photon epoch, Universe is filled with photons and remainder of baryons and leptons. The Residual Strong force-field starts binding baryons, effectively limiting the strong force to baryonic distances. 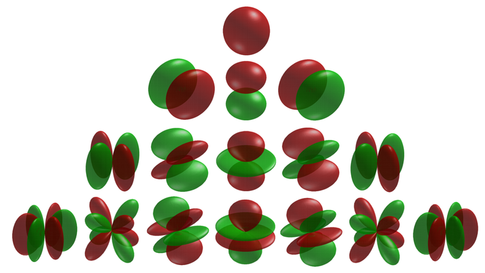 Baryons lose their status as independent entities, as nucleo-synthesis starts and atoms form. Vrsakapi confines the Soma to within the ahi. Indra/Baryons does not find any other place apart from ahi to drink the Soma. With the Residual strong force-field binding baryons and leptons into atoms, baryons do not find strong force outside the baryonic nucleus. Residual strong force-field confines soma/strong force to within the quarks (ahi) and the nucleus. Strong force field does not exist outside the baryons. Residual strong force field protects the baryonic nucleus by holding the nucleons in their place. The broken pieces of the top/head do not go/pass through creating a defectin the matter. Before the dawn, Vrsakapi manifests as a trimmer of Indra, filterer of Soma. The broken pieces of the top do not pass through creating a defect in the matter.. Residual strong force-field trims the mass of the nucleus and causes a mass defect. The sum of masses of nucleons is lesser than the mass of nucleus as the remaining energy is the binding energy. Some of the mass of nucleons do not go through the formation of nucleus. No female than I with better secret parts, none with a tighter embrace than I manifests. I do not press very close, power does not rise excessively. Electrons embrace such a nucleus bound by residual strong force field. Electrons come as close to the nucleus as possible (without falling in and getting annihilated). The electrostatic power that attracts the electron to the nucleons does not rise excessively. That primordial matter/amba is easily won over as I will become a limb/part. The electrons becomes a limb or part of the atom. Soon the entire primordial matter gets bound into nuetral atoms, as nucleo-synthesis proceeds. The electrons start oscillating/quivering in front,back with energy. What/Which good arms, good fingers, broad hair, broad backed, what wife of hero copulates you violently advancing vrsakapi.? These shapes do have broad back, broad top etc. They are oscillating in nature too. Though electrons are attracted to protons they are held in their place due to the atomic orbitals. The electrons that are oscillating, in different shapes of orbitals. Union of electron with proton is the first and oldest union that has happened in cosmic evolution.. Electrons become a satellite of nucleus, thus giving stability and near immortality to atoms. Without residual nuclear interaction this union is not possible. Electrons are produced from High energy photons in that epoch. The universe at that time of photon epoch was shining with photons, but also remnants of baryons (sons) and leptons (consorts). These fermionic drops are devourted, bound together in atoms and higher order atomic elements. Fifteen fermions of the lightest generation arise from the QGP of lightest generation quarks and gluons. These become the nucleus and form the interior of electron in an atom. Thus from the quarks and baryons a single nucleus emerges. When nucleus forms in nucleo-synthesis phase all baryons go into the nucleus without any remainder. All individual baryons either decay or become nucleus. Every baryon becomes part of a nucleus of an atom. This Indra vrsakapi (Binding energy of Indra or Nuclear Binding energy or the Residual Strong interaction) finds/discovers/knowsthe slaining of the hairy structure. Cutting, sewining new grains are filled/loaded/spread in the energy vessel/tank. The energy vessel/tank is the nucleus of the atoms. The Indra Vrsakapi, the residual strong interaction, binds the hairy structures cutting and sewing new ‘grains’ in that energy/sacrificial vessel. The baryons get destroyed to form a complete nucleus. In that process protons and neutrons combine in the nucleus. The nucleus is the energy vessel of an atom as it carries the most energy/mass of an atom. This/these go/lead to being clearly seen distinguishing Proton and Neutron. (Dasam and Aryam). I drink the cooked/simplified drinker of Soma (the nucleus is the cooked/simplified drinker of soma) the that is composed/steady, I am more clearly seen. Electrons envelope such nucleus of atom with more protons and neutrons and form higher order elements, which are more stable. As new grains form in the energy vessel, as the soma drinking ‘nucleus’ increases in size, in those distances of the semi-spherical surface and its divisions, very near force vrsakapi descends down as the home. In this sloka, the dhanva is the curved suface, ‘hrde’ that forms from the hairy structures, drinking soma, binding together and forming new grains, which are seen as Dasa and Arya. In short it is the Nucleus of an atom in Nuclear liquid drop model. Dhanva is the curved surface of the liquid drop model of nucleus. Residual nuclear interaction which is present only inside the nucleus. Nuclear binding energy is a measure of the strength of that interaction. Indrani is asking Vrsakapi the nuclear binding energy, the residual nuclear force, that settled down in the nucleus of atom to come back and produce a good net for the ‘riches’ produced out of amza. In other words Indrani is asking the nuclear binding energy to come back and trap more, forming a good ‘net’. While the nuclear binding energy forms the nucleus, the atomic binding energy helps to keep the electrons around the nucleus. In that way it traps the electrons around the nucleus. Thus binding of nucleons and then electrons form atoms, elements and compounds (whhich also lead to biological life) which could be viewed as a baryonic net of universe in which in every node Indra or Baryons are present. The entire universe an be seen as a Baryonic net or Indra’s net in which every node is Indra or baryons. Science says while residual nuclear force binds nucleons, Electro-magnetic force field born out of protons (Indra) binds electrons and expels the atomic binding energy. Thus atomic binding energy is different than nuclear binding energy caused by two different force fields, one that hurts/binds the nucleons (Indra) and one that is born/descendant of nucleons (Indra). The atomic binding energy binds higher and higher order nucleons and electrons forming newer elements. Higher order atomic elements that have ribs/orbits around nuclei, evolve life. The lightest generation of 15 fermionic drops that arose out of the QGP (with 12 quarks and 8 gluons) form the whole Universe including its life.